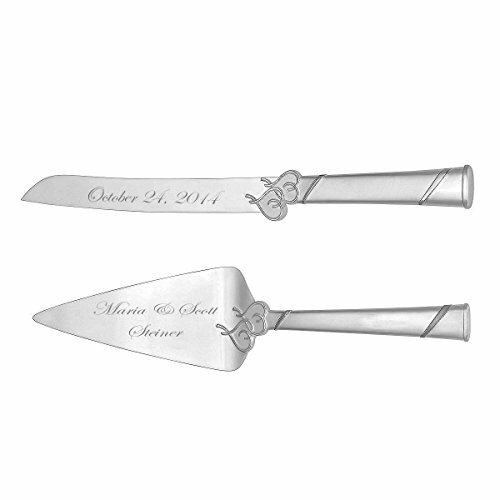 Engraved wedding cake serving set can be personalized with the couple's names and wedding date, monogrammed wedding gift will become a family heirloom. The personalized A special occasion calls for special serving pieces. And the elegant Jubilee Pearl Cake Knife & Server perfect for every occasion, beginning with the wedding cake. Inside the clear handle of each piece are dozens of pearl-like beads, creating a most sophisticated look. Can be engraved with full names and date! Choose from any of the font styles shown to the left of the product picture. Perfect for serving wedding cake and more. If you have any questions about this product by A & L Engraving, contact us by completing and submitting the form below. If you are looking for a specif part number, please include it with your message.